Monoblock plants of the type (BIOTAL-MPW) are designed for deep biological treatment of household wastewater from 1.5 to 10 m3/day. A feature of this type of monoblock plant is that the excess active sludge is pumped into a separate well, where the stabilization and compaction processes take place. Cylindrical polypropylene bioreactor, divided into cleaning zones, is located in an underground ferro-concrete well at a distance of at least 5 m from the residential building. The annular gap between the walls of the plant and the wall of the well, after filling the unit with water, is filled with a cement-sand mixture layer by layer, with “soaking” the water. With gravity flow of sewage to the plant, the marking of the bottom of the wells is determined based on the mark of the bottom of the supply pipeline. The automatic control unit of the BIOTAL plant and the blower can be installed in an existing non-residential heated room equipped with ventilation, a specially constructed blower building or in a box-recuperator that is installed in the well ceiling. Cables and air ducts must be laid in protective cases. The maximum distance from the plant to the blower building is 20 meters. The drainage of treated sewage is possible by gravity or by a pump installed in the tertiary settler of the plant. Please note! The warranty period for BIOTAL plants is 5 years, for the control unit and blowers – 3 years, for pumping equipment – 2 years. Detention of coarse impurities at the BIOTAL plant takes place in a large stainless grid with two-sided air bubbling and a fixed cover. A device designed to transfer treated sewage into a biofilter-tertiary settler, the design of which prevents entering of surface contaminants to the next cleaning zone. 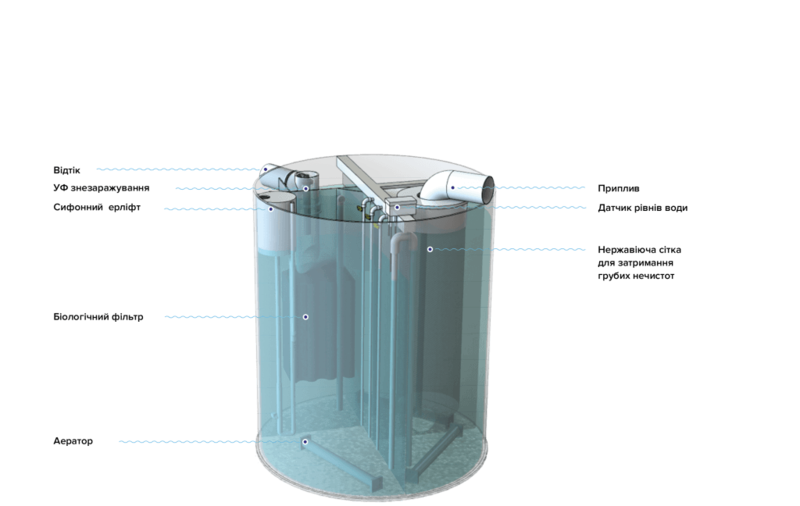 Self-cleaning biological filter provides post-treatment of waste water, and also works as a thin-layer settler. Is designed for the timely delivery of signals to the automation of the plant, which in turn automatically switches the system into one of 7 programs, which saves up to 70% of electricity. The ultraviolet water disinfection unit is equipped with a lamp with radiation in the UV-C range with a wavelength of 254 nm. The aerator is made of PUR membrane with laser perforation, provides small-bubble aeration of waste water, which allows to increase the efficiency of saturation of sewage with oxygen, and also improves the absorption properties of bacteria of activated sludge. © 2006-2018 Biotal. All rights reserved.